Cruise 1: Our looking glass onto the sea-floor…..
Dr. Fabio Sacchetti from the Marine Institute (INFOMAR program) has joined the BRITICE-Chrono survey cruise as Irish Observer and multibeam/geophysical support. As Irish Observer Fabio is overlooking survey operation when in Irish water and makes sure that the survey does comply with Irish standard practices. From a scientific point of view, Fabio has spent the last 11 years mapping the seabed offshore Ireland and the last 4-5 years studying its glacial geomorphology. Back in Ireland Fabio works for the INFOMAR program as hydrographic team leader and onboard the RSS James Cook looks after the multibeam and geophysical data acquisition and processing during the night shift. So far the collection of good quality multibeam data has been quite challenging for a number of reasons. The ship is equipped with 2 Kongsberg multibeam systems, the EM710 (for shallow to medium water) and the EM120 (for deep water). The data from both systems are routinely collected day and night and they need to be quickly cleaned and tidally corrected in order to be able to create useful bathymetric surfaces. These info are then used for many purposes including geomorphological interpretation, core site selection and ultimately to make sure that the sampling gear are not deployed over risky seabed. At the start of the survey both multibeam systems had to be calibrated in order to provide the best data quality. After few days and with the weather picking up a bit it was also obvious that the motions sensor (which is needed to precisely correct the swath data) wasn’t performing properly. Further modifications to the standard setup had to be done in order to remove motion artefact that were affecting the usability of the data. 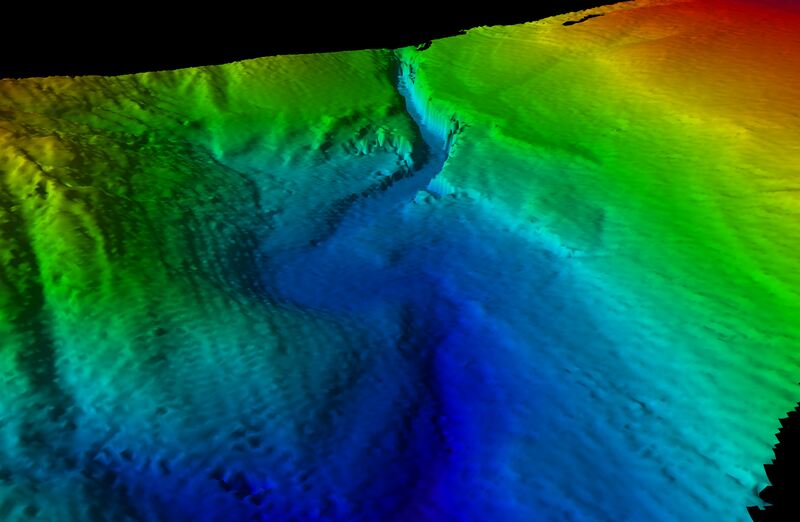 3D image of a canyon head used to calibrate the multibeam systems. Fabio says: so far this has been an exciting scientific cruise simply due to the sheer amount achieved by the scientists and crew aboard the RSS James Cook, especially in light of anticipated challenges posed by the type of glacial sediment required to be cored, which is proving to be incredibly hard to penetrate. Working with some of the best marine glaciologists in Europe is exciting and challenging at the same time. Data are not just collected but analysed and interpreted on the fly and this contributes to a more hectic, clever, and scientific hands on approach, which makes the all survey way more interesting. It is also a pleasure to see how much projects such as INFOMAR can support and help the scientific communities providing top quality multibeam and geophysical data free of charge, which has been fundamental during the planning of this ambitious research project. 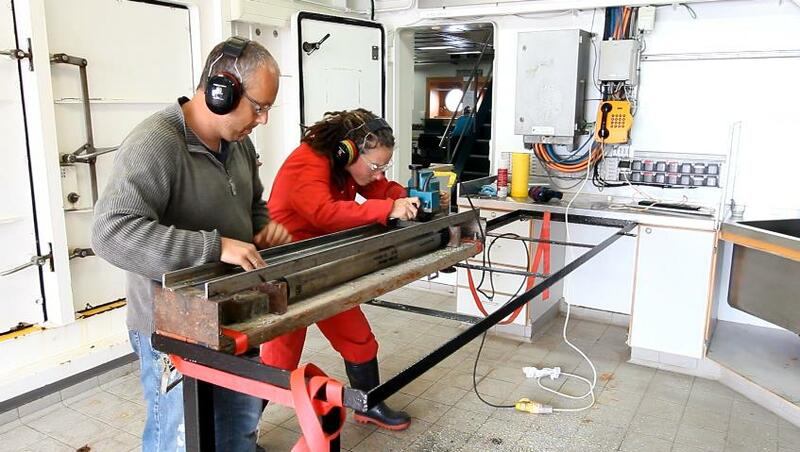 The RRS James Cook is an exceptionally good platform for survey and sampling operation with top class facilities and lab space. This is an incredible experience and allows me to learn how things are done onboard one of the best research ship in the world. Fabio: more than just geophys, a dab hand at DIY….. This entry was posted in Marine geology specific issues, Uncategorized and tagged briticechrono, Cruise, geophysics, marine sampling, multibeam, transect 4 on July 25, 2014 by briticechrono. End of an Era ……….for the mighty British-Irish Ice sheet and our mammoth fieldwork campaign.